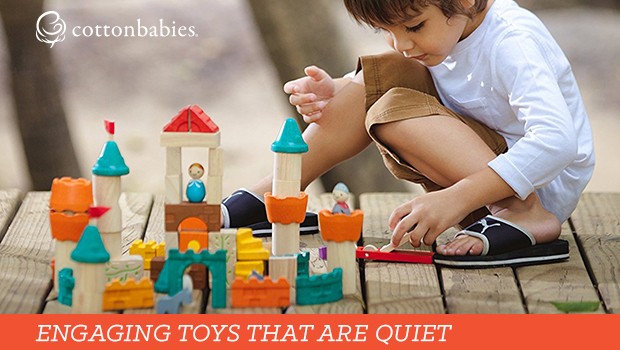 Finding quiet toys that keep your child entertained and engaged are hard to find. Sure, it’s easy for kids to zonk out in front of the TV or video game, but it’s nice to have a toy that allows them to actively engage their imagination. Plus, it’s great if it can hold their attention longer than 5 minutes. Here are a few of my favorite quiet toys for my toddlers. They go back to these toys again and again. And one of my favorite features? They’re quiet! Some of these are quiet and portable enough to take to restaurants, church, etc. These are by far one of the best toys I’ve ever purchased. Ever. To be honest, I even enjoy playing with them! There’s just something fun about magnets! There are sets at every price point and you can easily mix and match pieces from sets with each other. I keep a set in my diaper bag at all times. Another favorite in my house. Even my 16-month-old enjoys “painting” with the water. Water Wow have kept my kids occupied while riding in shopping carts, the car and at restaurants. There are many themes to choose from, so it’s easy to find one for each kiddo to play with. Stacking toys are so great for younger toddlers. I love this Chewbeads stacker because it doubles as a soother for teething babies, too. Blocks are, in my mind, a building block of childhood. Pun intended. If you get your family a nice set of wooden blocks, there’s a good chance they will last until you have grandkids. They are great for so many age levels and really allow kids to tap into their creative side. These books are AMAZING! They are seriously basically indestructible. They can really take a beating and still look brand new. These books are waterproof and tear-proof. You can literally run them through the dishwasher. My kids have always loved holding onto toys at mealtime and trying to sneak non-bath toys into the tub. With Indestructibles, I don’t have to worry. They can take it! These easily slide into the diaper bag. They are my go-to baby book for baby showers. Does your child love to build? Mini Squigz are a great spin on classic building toys. They stick, they snap, they’re tons of fun. They keep kids occupied and quiet. Plus, you can easily wash them off. This take on the classic puzzle is sure to please. Make some artwork and then pack it up in a handy tin. What are some quiet toys you would recommend to another parent?